What if we told you that a flower from the garden could be the key to a pest-free house? You'd probably think we're crazy, right? Well, as it turns out...that's not so far off from the truth! You see, there's a major pesticide out there that you've probably never heard of called permethrin, and it's made out of—you guessed it—flowers! So it's got to be safe, right? Stay tuned and keep reading. We'll cover everything you never knew you wanted to know about this pesticide in the definitive safety guide down below! When Should You Consider Using A Permethrin-Based Product? Is Permethrin Dangerous To Humans? Is Permethrin Dangerous To Cats? Is Permethrin Dangerous To Dogs? What Does The Government Think About Permethrin? Permethrin is an insecticide that mimics the natural bug-busting qualities of the chrysanthemum flower. This synthetic chemical was designed to harness the power of pyrethoid insecticides, the chrysanthemum derivatives, and kill insects both indoors and outdoors. As with many other of its competing insecticides, permethrin works by attacking and henceforth shutting down an insect's central nervous system. Its primary method of achieving this is to paralyze the nerve and muscles, which leads to a swift death after a "knockdown" effect. According to the National Pesticide Information Center, there are over 1400 products registered for public use with contain permethrin. Generally, these are all used for pest control, and come in many forms regulated by the US Food and Drug Administration. Whether you're finding this in a ready-to-use plastic container, an aerosol canister, or you're loading your own spray nozzle to administer this throughout your home or garden, permethrin spray is probably its most common form. 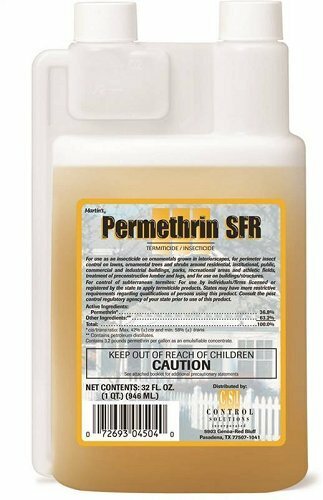 Generally, consumers will find permethrin spray in a concentrated form bearing the same name: Permethrin SFR. This is meant to be mixed with water and sprayed through a backpack-type spray nozzle outside the home in the yard, and targets pests for over 3 months with residual action. A favorite for hard-to-reach spaces and low-traffic areas, many pesticidal dusts are available with permethrin as the active ingredient. These dusts are used mainly in attics, basements, between cracks in floorboards, and other tight spots that are usually easy to miss by conventional pesticide applicators. Permethrin binds more tightly to clothing than any other pesticide, making it more efficient than its competitors when sprayed onto fabrics. Because of this, it's the only EPA-approved insecticide to be sprayed onto clothing and sold that way; and it's bound to items like garments, shoes, and mosquito nets. Permethrin is beneficial because it not only closely mimics the natural efficacy of the pyrethoid family of pesticides (the ones that come from chrysanthemum flowers), but it's normally the most versatile. For example, permethrin can be used both inside and outside, in industrial and residential environments, from schools to restaurants to gardens...even inside a kitchen, if you do a little extra legwork. For all of permethrin's benefits, is there a downside? What's the catch? But we all know that sometimes, accidents happen. How does permethrin react in the body if humans accidentally get a little too close? What's the worst case scenario? In addition, the EPA considers permethrin "likely to be carcinogenic to humans" when ingested, as per their Reregistration Eligibility Decision. Unfortunately, permethrin can be severely toxic to cats. Their livers do not have certain enzymes that are required to process the chemical compounds which are present in permethrin, which leads to a condition called permethrin toxicity. To get an idea of just how sensitive cats are to permethrin, take a look at the video below of a cat who was taken to the vet after coming into contact with permethrin. Warning: this video may be disturbing for some. In controlled trials, dogs were fed small doses permethrin over a period of 96 days and shown to exhibit some signs of toxicity. Their symptoms were nowhere near as debilitating as those of cats, but it became clear from the results of these tests that permethrin can, indeed, harm dogs as well. There are a few different flea treatments out there designed for use on dogs with permethrin as the active ingredient. While these medications may not hurt your dog (and that's a big "maybe"), keep in mind that the side effects could be utterly devastating if you have a cat in the house, or if your dog goes outdoors anywhere near someone else's cat. In the controlled study, the dogs fed permethrin over a period of time displayed neurological defects and tremors. We mentioned earlier that all products containing permethrin are controlled and regulated by the FDA. But what do some of the other big branches of government think about this insecticide? In addition to its reregistration data, the EPA has published a full-scale fact sheet with all the details of permethrin. Periodically, the EPA will reevaluate all pesticides registered before the year 1984 to ensure quality and safety, and currently, permethrin is up to date on its evaluations. When used as directed, the EPA recommends this product as a viable option of pest control. The CDC lists permethrin in one of its pretravel bulletins as a general protective measure in order to ward off mosquitoes from clothing and gear. In a separate bulletin, the CDC gives advice on how to treat clothes with permethrin for maximum efficiency and safety. What's the big difference between permethrin and its competition? Remember how we said that permethrin is a manmade version of a pesticide that comes from the chrysanthemum flower? Pyrethrin is that exact pesticide. Essentially, the only difference between these two is that permethrin is the synthetic version, and pyrethrin is au naturale. As far as insecticides go, these two are both very effective at keeping mosquitoes and other biting insects at bay. However, DEET's strength rests in that it was developed to be applied topically to the skin, and permethrin works much more effectively as a binding agent on fabrics like clothes and equipment. In addition, DEET is generally found in the kind of bug spray you'd see in a drug store, whereas permethrin is a pesticide, meant to be sprayed in your yard. Much like with DEET, Picaridin (which actually is a DEET alternative) is recommended for use on the skin. Permethrin, on the other hand, is recommended for use on gear and clothing instead. Again, like DEET, Picaridin is bottled up on a shelf in a store for the public, whereas permethrin is locked up due to its status as a RUP (Restricted Use Pesticide). The most glaringly obvious difference between these two chemicals is this: fipronil doesn't harm pets! Fipronil is the active ingredient in a few brand-name flea medications like Frontline and Frontline Plus, which treat fleas on both dogs AND cats. Permethrin, as we've shown, is harmful to dogs and all-out toxic to cats. Though these two synthetic pesticides work in the same way, the insects they target are a bit different. Permethrin works to target primarily mosquitoes, ticks, fleas, scabies, and other biting insects. Deltamethrin, on the other hand, kills cockroaches, beetles, flies, and bed bugs. Much like Deltamethrin, Cypermethrin's targeted insects differ from that of permethrin. Cypermethrin is used to combat wasps, carpenter ants, carpenter bees, yellowjackets, and scorpions. As you may be able to tell, permethrin brings much more to the table than it takes away. It's a reliable pesticide with a low toxicity rate to humans, and it's rated favorably by the FDA, the EPA, and the CDC when used as directed. However, pet owners must always keep their eyes open if they choose to use this chemical in their homes. Cats that come into contact with permethrin can die, and dogs can suffer neurological damage. It's important to weigh these options when deciding whether or not permethrin is a route you want to take to solve your pest control needs.